Cathy--Usually, with the WOW posts, I can tell it's one of yours by just the title. And your posts always either connect writing to another activity in a clever way or they break down a writing dilemma into manageable bits... or both. Unfortunately I've never had this problem, but I'm glad your friend made the right decision for them. Saying "No," is one of the most difficult things for people and I think, women to do (no matter the issue). In the past was a difficult issue for me but a long time ago, someone recommended a book to me and it has been my go-to reference when that problem raises it's head. I've given many copies away, but for those struggling with saying "no," I can't think of a better resource.The book is, "When I say no, I feel guilty" by Manuel J. Smith, Ph.D. Highly recommend. I'm glad your friend did what was right for her. Thanks for sharing such an important post. Learning to say "no" can be very liberating. Thanks for the book rec, Sheila, I'll check it out! And Sioux, you're not unfortunate at all. I'd say you were pretty lucky! YES. To all of this. 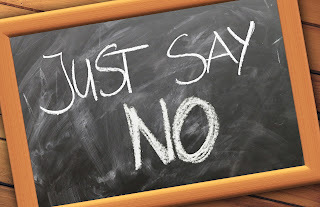 Saying no just feels wrong, especially when it comes to writing and you're trying to get your foot in the door, any door, just please let me get my foot in! I've learned though that sometimes it would take SO long to figure out what they want, and how they want it, and if that's the case maybe that particular job wasn't right for me. Writing is definitely work, but it still should be something you're passionate about. Great post, Cathy! Your article is a great reminder not only for writing, but also for life commitments. I often feel guilty about wanting to say no, but my husband says, "A decision motivated by guilt is never a good decision."